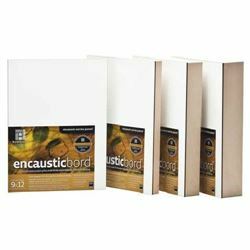 The painting card made for encaustic art application is designed to allow re-working of the wax block colours with the iron at any future time. The surface is semi-gloss and sealed on both sides. Very good for some rubber stamping techniques too. Ampersand Encausticbord 1/4" 8" X 10"
Ampersand Encausticbord 1/4" 8" X 8"
Ampersand Encausticbord 1/4" 9" X 12"
Ampersand Encausticbord 1/4" 10" X 10"
Ampersand Encausticbord 1/4" 11" X 14"
Ampersand Encausticbord 1/4" 12" X 12"
Ampersand Encausticbord Deep 1.5" 6" X 12"
Ampersand Encausticbord Deep 1.5" 6" X 6"